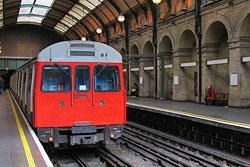 The London Underground is an essential transport network that all visitors and residents of London rely on heavily. Loved and hated by the millions of commuters who use its services to get around Greater London, the Underground can be a daunting prospect to the uninitiated. I hope this review goes some way to putting your mind at ease because, once you have mastered the Tube Map (a design classic) and Underground System, the City of London is a much smaller and easier place to visit, and more importantly, to get around. First of all some facts and figures on the London Underground, which is also known as ´The Tube´ because of the shape of the tunnels. Interestingly only 55% of the network is actually underground. It is the world’s oldest underground railway, and construction started in the early 19th century. By 1863 the first six stations had been completed. Obviously the network has moved on significantly from then and in 2007 over one billion journeys were recorded across the network which serves 270 stations and is connected by 250 miles of track. So how does it work? London is divided into six separate zones, Zone 1 covers Central London and moving through the Zones you end up in Zone 6 which covers the outer edges of the network extending to the suburbs of Greater London as well as parts of Essex, Hertfordshire and Buckinghamshire. To give you an idea of the scale of the zones London Heathrow is found in Zone 6 and is the final stop on the West Bound Piccadilly Line service. If you look at a Tube Map you will easily be able to identify the different Zones so that you know exactly what sort of ticket to buy. If you don’t need to travel at peak hours (before 09:30am) the easiest and most cost efficient ticket to buy is an all-day Travelcard. These cost around £7.00 and allow travel across the entire network for the whole day. Considering that a single journey can cost more of £4.00 each this is a real bargain. Travelcard is available for purchase at most Underground stations. If you are unfortunate enough to have to travel at peak morning rush-hour for a week or more it will be worth considering an Oyster Card. This is a smart card which can be charged with credit at the station kiosks or machines. You touch these to the Oyster Pads on the ticket barriers and the system automatically deducts the correct fare once you touch out again at the end of your journey. One word of warning, it is not worth trying to travel on The Tube without a valid ticket, the penalty fares are expensive and London Underground often have spot checks throughout the network. The Tube Map is indispensible in trying to navigate the maze of different lines. It is a schematic representation of the network, but is not to scale. It is designed to show the relative position of stations to each other as well as where inter-changes are available. All of the 12 lines have different colours which makes them easily identifiable not only on the map but in the stations’ tunnels as well. With a little bit of practice it is easy work out how to get from North to South, East to West or wherever you need to be by making just one or sometimes two changes. A couple of warnings about this fantastic transport system: it can get extremely crowded (and hot in the summer months) during the morning (07:45 – 09:00) and evening (17:00 – 19:00) rush-hours. Londoners are in general a very friendly bunch, however, don’t be surprised if you get a few nasty looks and perhaps even an elbow in the ribs if you get in their way during the commuting hours. 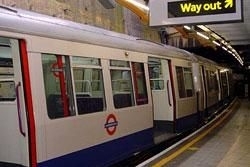 I would suggest trying to avoid the Tube at these times. When riding the escalators in the stations the convention is to stand on the right and walk up or down the left, but don’t worry if you forget, a local will soon remind you. Please also be aware that pickpockets do operate on the network, please keep your personal belongings safe. MIND THE GAP and enjoy the ride!